NIRH supports a proactive and unapologetic approach to reproductive rights, health, and justice through bold advocacy, creative education campaigns, and high-impact partnerships. Through our partnerships with more than 170 organizations in 64 localities and 43 states, we have helped groups on the ground pass laws, improve policies, strengthen coalitions, and build grassroots support to advance reproductive health, rights, and justice. On September 29, 2016, the Philadelphia City Council, led by Councilwoman Cindy Bass and Councilwoman Helen Gym, unanimously passed a resolution calling for passage of the EACH Woman Act and for an end to state and federal bans on insurance coverage of abortion. In taking this action, the City Council joined its Board of Health, who passed a similar resolution in February 2013. The City Council featured moving testimony from advocates on the importance of passing this resolution. Read the press statement from Women’s Law Project here. 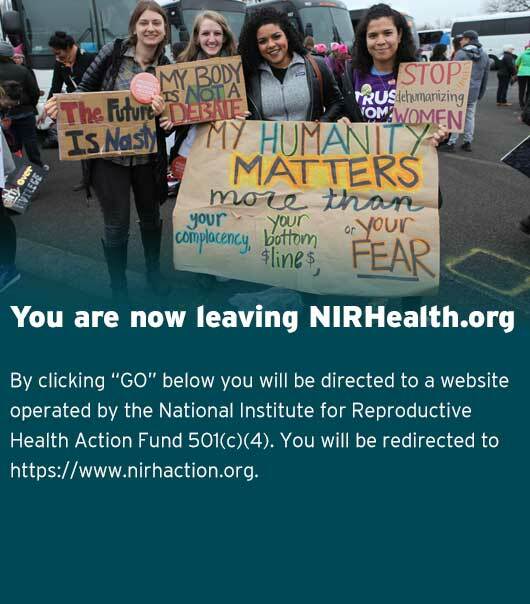 Since 2008, NIRH has engaged in an ongoing campaign to inform supporters about the threat posed by anti-abortion movement to criminalize women who access abortion care. In 2016, NIRH supported the implementation of new laws in Massachusetts designed to prohibit the shackling of pregnant incarcerated women and improve the treatment of pregnant women in prison overall with our partners Prisoners’ Legal Services and the Prison Birth Project. They engaged in public education, media outreach, advocacy with executive branch officials, and research, and ultimately published a thorough report about the first year of the law’s implementation. To read more about our work on decriminalizing abortion, click here. Tired of seeing the fraught term “pro-life” used ubiquitously and incorrectly, we conceived of this Google Chrome extension to shift the language of the discussion towards a more accurate framework. When downloaded, this Google Chrome extension will change any instance of “pro-life” to “anti-choice,” revealing the phrase for what it is: an attempt to stop women from having control over their bodies, their futures, and their lives. Conventional wisdom frequently suggests the public is deeply divided on abortion and, at least tacitly, approves of the kinds of restrictions states have passed to limit a woman’s access to it. From 2015 – 2017, NIRH has conducted qualitative and quantitative research — including focus groups in ten states across the country and two nationwide polls — to harness voters’ latent support for abortion access.